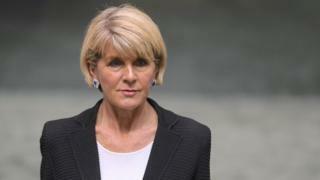 Australia's Foreign Minister Julie Bishop has announced her resignation from the cabinet. Her move came as new Prime Minister Scott Morrison named his cabinet after winning a bruising leadership contest on Friday. Ms Bishop said she had not yet decided whether to stand at the next general election, due in 2019. WhatsApp group chat messages leaked to Australian television network ABC show Liberal Party colleagues tactically voted against her to stop a victory for Peter Dutton, a conservative and former home affairs minister. The leadership fight also ended her 11-year tenure as deputy leader of the party. "I will remain on the backbench as a strong voice for Western Australia," she said. Mr Morrison announced on Sunday that Marise Payne would replace Ms Bishop as foreign minister, while Mr Dutton gets his old job back at home affairs. The Liberal-National coalition government has only a one-seat majority in parliament, and Labor is ahead in opinion polls, with an election to be held at some point before May 2019. Mr Dutton had unsuccessfully challenged Mr Turnbull on Tuesday, but his narrow defeat only stoked further discord. A former Tourism Australia official, Scott Morrison entered parliament in 2007 and has since held three key ministerial portfolios. As immigration minister, he drew criticism over the controversial asylum seeker policies and offshore detention centres. Video How did we get here?